For people not from Brisbane, you can also watch the seminar via hangout on air (Google+/youtube). We are adding also the question/answer plugin to the hangout for those interested. Beers and snacks available afterwards-as part of CSIRO social club! Summary: Many countries are pressured to engage economic diversification policies to sustain growth in volatile economic and climate contexts, while reducing pressure on common-pool natural resources. In forest commons, practical issues undermine local government efforts to engage such reforms; including the long-term risks to forest biodiversity, carbon biomass and livelihoods of entrusting a more diverse portfolio of species to manage, harvest and sell to empowered local communities. For this reason, legitimate conflicts between state, market and community stakeholders frequently arise from this effective lack of trust. With so much at stake, scientific guidance can help with building trust between parties to achieve sustainable human-nature integration in forest commons through livelihood diversification. 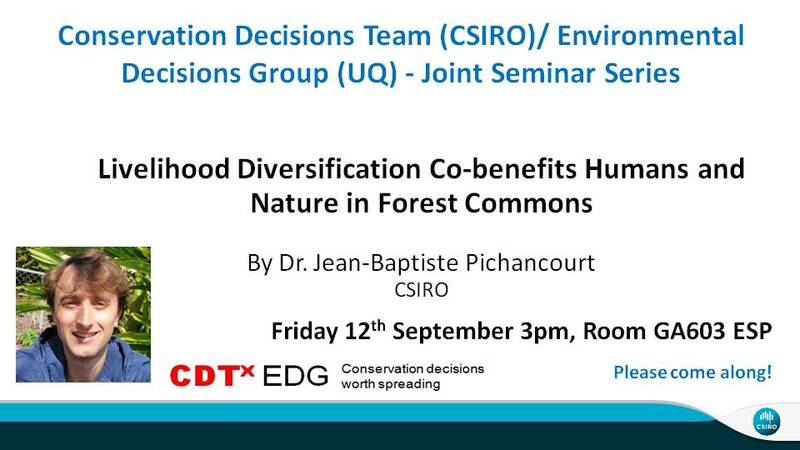 In the presentation I will show with a modeling approach, combined with available biological and social knowledge from the literature, that entrusting to local communities a more diverse portfolio of species to manage, harvest and sell for timber and fuelwood, could paradoxically co-benefit the long-term tree biodiversity, carbon biomass and harvesting incomes under climate change. Results show that this approach is at least as good or arguably better in term of co-benefits, than land-sparing strategies aimed at guaranteeing optimal biodiversity return in conservation zones (but locked from people for harvesting) and adjacent to high-yield mono-specific stands optimally harvested for timber, firewood or carbon (but poor in biodiversity). This work suggests that reconciling human and nature objectives do not necessarily need hard and prescriptive social-ecological transformations, e.g. through land-sparing. Rather I demonstrate the potential of a softer and non-prescriptive adaptation alternative, which supports the rights of communities to manage, harvest and supply freely (under certain land-tenure, power and rule-making conditions discussed in the paper) the level of diversity of non-threatened tree species that matches their needs in forest commons. The present study and modeling framework are opening novel ways for predicting when and how it becomes legitimate to integrate the harvesting activities of the 1.6 billion rural people, who depend from forests for their livelihoods, into sustainable development plans for areas pressured by unpredictable changes.